VIOLET SHADES Voila! When it's time to blog it's always about my hair (hahaha). Truth is that I've been back to Kenjo Salon to touch up my hair color twice after my rose gold hair, so I want to blog about them before I missed them out. 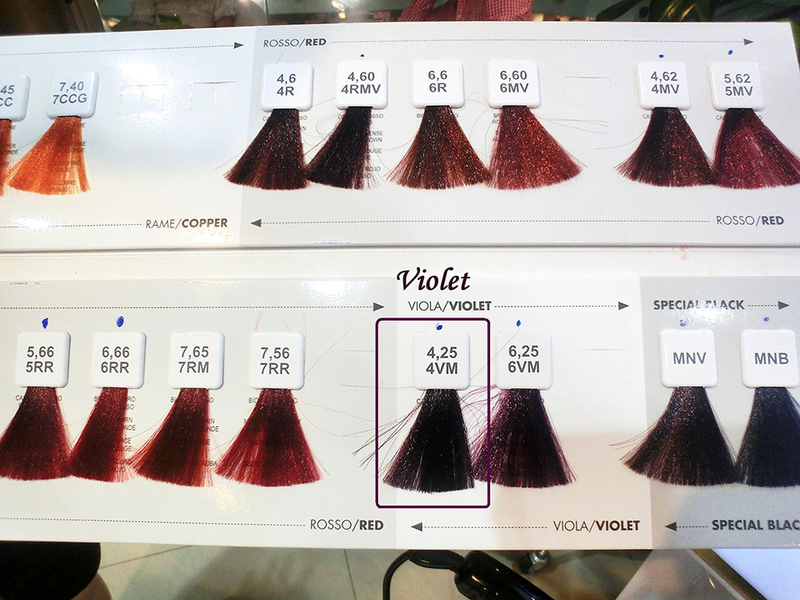 I've colored it violet purple and mahagony brown, so this post will be for my violet hair! The rose gold color in my hair had quickly faded to caramel blonde (as with all bleached color, they are always pretty as it lasts, but good thing is that I can opt for a change again!). 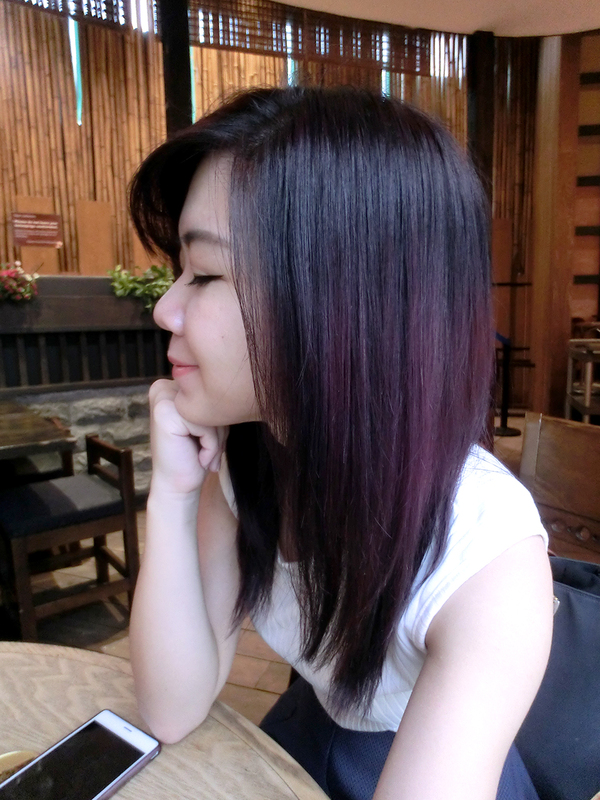 So when I went back to look for Zenn at Kenjo salon, I asked her why not we try for a darker shade this time.. but with a tinge of purple this time. I seriously love my light color hair base because it's always so easy to do coloring on them now. So this is the color which my rose gold hair had faded into about a month plus later. No split ends even though it's been some time since i last had my treatment after I bleached my hair at Kenjo (yay!). 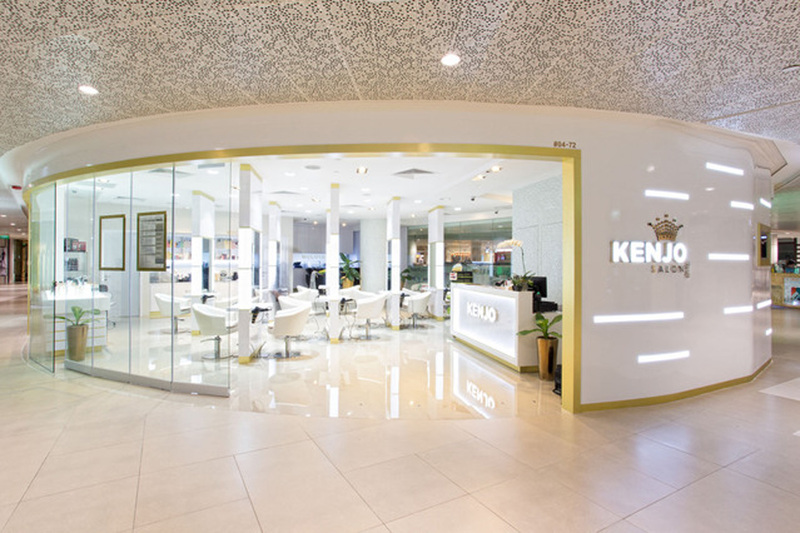 Having my hair done at Kenjo always puts my heart at ease because somehow or rather, even though I may have bleached it, my hair hardly gets frizzed out and they are always easy to manage even by myself. 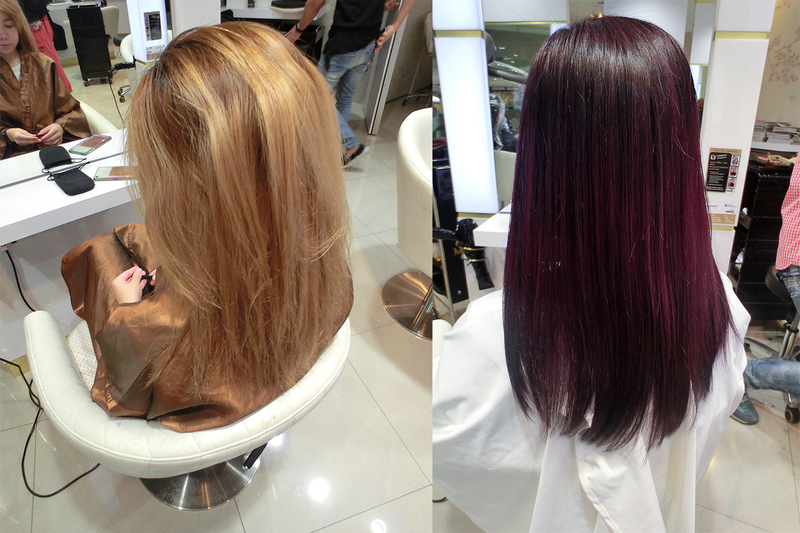 Violet purple here we go! And as with all visits to Kenjo, I realised that they are always using something new for the hair! 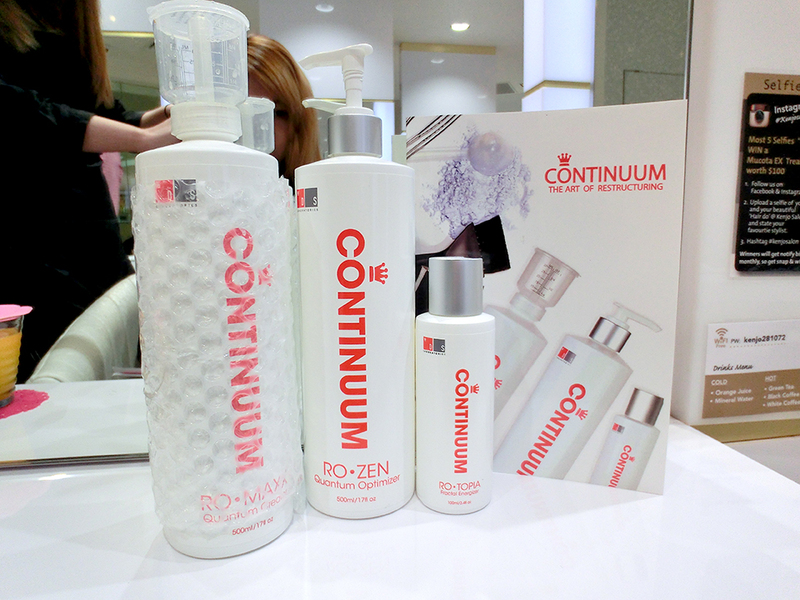 This time round it's Continuum Ro•Zen hair care products. This range of products effectively reduces hair breakage during coloring, where it is basically used to repair over-processed hair, giving it texture and shine by reconnecting the cortical strands of our hair. Apart from coloring, Volume Rebonding, Korean Volume Setting Perm, Digital Perm and Argan Oil Treatment are some of Kenjo’s best treatments. 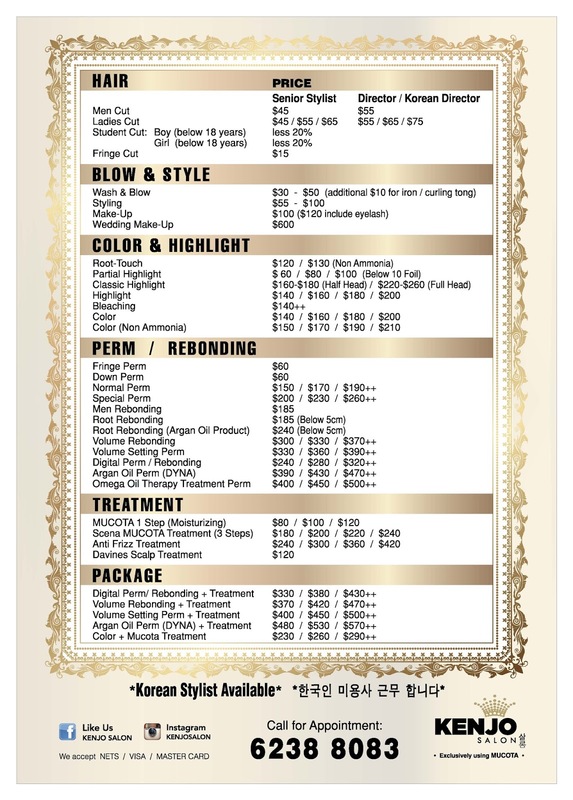 If you girls (and guys) would also pamper your hair with a new color or a perm, do look for my stylist Zenn Tan at Kenjo! P.S. 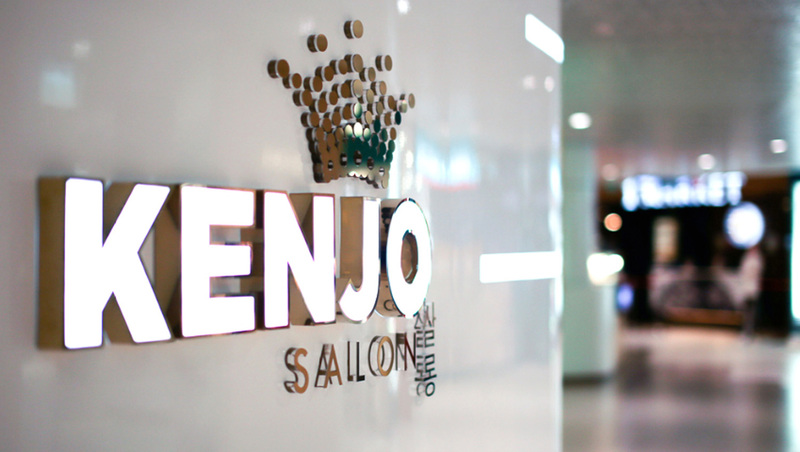 You can also mention my name Jaslin to enjoy 15% off on all ala carte services at Kenjo! While the services are sponsored, all views and opinions are my own. In this message, we will explain you how our service works. Read it carefully. Its reading will not take more than 10mins. We kindly ask you not to answer without have read the entire text. Those who answer without have read everything, ask questions that are answered here!! We assist computer "HACKING"....For years now, We've helped organisations and so many sites, Bank Accounts, school upgrades also clear criminal records of all sort and in short timing hacked petty cyber sites accounts like Skpe, Fb, Whatsapp, Tinder, Twitter but these are significant experience a good and effectively recognized organisation must firmly ascertain and minorly our "AIM" here. 1◾the aim is to render proficient solution to those having cyber issues and technically needs a hacker to get their job done effectively fast..!! 2◾ to recruit real hackers (gurus only) in need of job with or without a degree..!! Protocolhacks@gmail.com or we probably recommend you others like: Cybershieldnotch@gmail.com or cybershieldnotch@protonmail.com they can be trusted, we can be trusted Thank you!!! If you need to hack into any Database, Delete Record, Improve credit score, spy on Facebook, Instagram, Whats app, Text, Phone, & Emails, as long as it's hack contact contact Ross Williams on his email rosswilly@cyberservices.com or text : +1(601)452-6833 He is great, you won't be disappointed, cheap and fast, ( he saved my relationship, Let him know Willie Kalousdian referred you. Good luck. I remember my experience with hackers i contacted online, i almost lost hope in finding out if my husband was loyal to me and has been loyal in our 20 years marriage, i lost a lot of funds in paying these so called hackers so i made up my mind that if i get scammed again i'll just forget about finding out what God doesn't want me to know, Then i saw reviews about ( mikejosh@cyber-wizard DOT com ) and decided contact him and if and if i hear any stupid excuse won't contact anybody and just accept that God doesn't want me to then he proved to me that he isn't a cheat by working a sample job for me but to my greatest surprise he did the job and sent results to me fast, i was so happy but sad part was i divorced my husband, and i will drop an advise for people who wants any kind of hacking services stopped being scammed by people who impersonate being hackers, contact ( mikejosh@cyber-wizard DOT com ) for a fast and clean job. Thank me later. 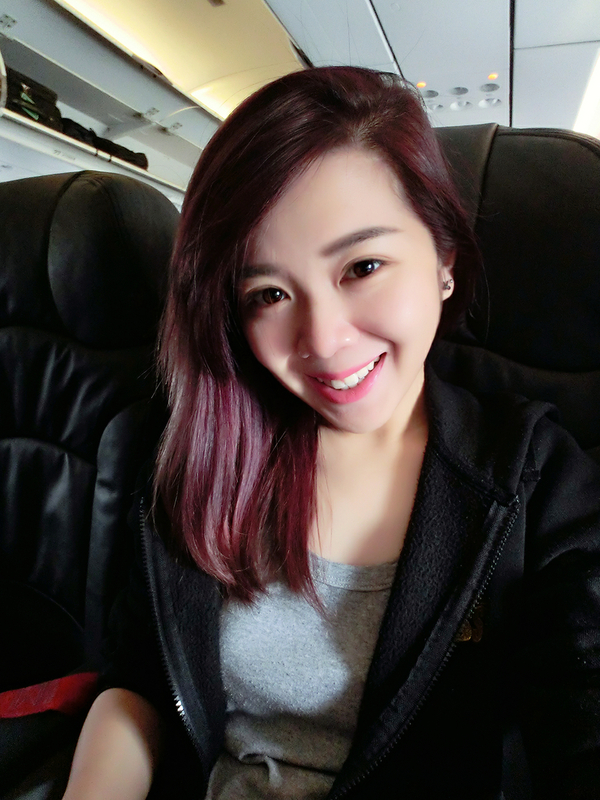 Hi everyone, I came across this amazing hacker online called Kenny Blackhat and he did an amazing work on my husband's iphone X after I had the feeling of him cheating on me with a friend of mine. This has been going on for the pasted 3 months before I came across Kenny blackhat who give me the option of a full cell phone hack that I got access to every information both deleted information of his chats with her. Thanks to Kenny and feel free to contact him on kennyblackhat@hackermail.com 717-388-3985 if you are interested to work with him. Katie Russell is my name. trust me having few late payments and collections on your credit report, can be very frustrating. for many years this restricted me from securing a mortgage loan to balance the already available funds with me, sort some other bills and have enough funds with me when i was to buy my house. this gave me a whole lot of stress as i got frustrated and almost gave up . i have a fellowship friend who we bond . she narrated to me how she got repossessions off her credit report by a specialist / repair hacker by the email reach QUADHACKED @ GMAIL . C OM . she met online. i was very reluctant because in have had mine for years and she had barely had hers for 2 years on her report . i gave him a try and he worked excellently well, he applied and confirmed for the removal . this gave my credit score a boost and place it on a path of constant increase . right now i'm on a 762 all thanks to them. hit them at Q U A D H A C K E D @ G M A I L . C O M .